A property settlement agreement may not be a major discussion topic for most folks. However, in some situations in life, they function as a necessity to sort things out and be able to move on. Unfortunately, enough bad stories pop up out there that people dread the idea, and they come to the table with all sorts of preconceptions that then get in the way. Splitting up assets in a divorce is never a light endeavor, especially if there have been negative experiences within the relationship. 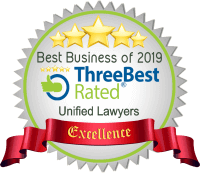 We seek to make this difficult time as painless as possible and the family law team at Unified Lawyers will ensure you have a smooth and speedy resolution to your matter. The key to a successful settlement agreement starts off with a good, clear goal. And that goal should be something similar to protecting your future with binding financial agreements that work for your situation as much as possible. Most people figure this part out pretty quickly, or they inherently realise it’s what they should be after when someone else like the family court starts to get involved. The implementation part, however, tends to be more difficult. Because property settlement agreements are not a typical coffee table discussion item, many do not know their options for an agreement when they go into the process of creating one. No surprise then, people instead hire a professional to make all the decisions, which then means the person ends up going down an expensive, protracted path that may not be the right agreement approach for their situation. Anyone who is in a marriage or civil relationship, i.e. default marriage under the law retains the right to craft to a property settlement agreement. For those officially married, license and ceremony, the Family Law suggests the transition to an agreement occurs if the marriage needs to end. However, things get a bit iffy where the marriage exists in a non-official capacity, such as in a de facto relationship (i.e. a domestic partnership for so long under the law that it’s treated the same as a marriage legally). Part of the confusion stems from the term varying from province to province in Australia. For example, in Western Australia province law doesn’t include the concept of a de facto marriage. However, other provinces like Victoria and Tasmania recognise the status. You also need to act on finalising the agreement within a given deadline. For those officially married, divorce affects the deadline remains 12 months after a divorce gets finalised for a property settlement agreement to be put into place. For those in a de facto relationship, the deadlines interestingly move out farther and take 24 months from the date of official separation. Fortunately, folks need not wait for a divorce to happen to get started. A property settlement agreement can be started and negotiated before finalising the divorce. On the other hand, if there is no official marriage, then folks need to wait at least until there is a commitment to separate. Being able to get started early just makes sense, and by the time the divorce reaches finalisation then there’s no need to protract house settlement problems or other issues with more meetings afterward. And many experts believe getting technical agreements done and out of the way as soon as possible produces the best results in a separation as well as the most equitable sharing. It also avoids protracted arguments when property values change significantly, such as housing values. You can include even pets in a property settlement agreement. Basically, any shared obligation, debt, money, asset or property sits in determination by the court. There are very few items or property that the court can’t reach and make a decision on in a divorce or separation. As a result, having an agreement makes so much sense because the court will appreciate the fact that the parties have already agreed to a determination, saving time and avoiding work for the court itself. There will be differences on how they distribute specific items, but a couple of actions can help clear up the ambiguity that usually leads to stress and arguments. Estimate the value of assets and come to a general agreement what they are worth. Real property such as a home can be determined objectively via the help of a licensed valuer/appraiser. Real estate agents can help too if both partners are fine with an unofficial estimate. Try to identify what each spouse has brought into the shared property pool. Figure out a likely budget that each partner needs to move forward independently after the divorce or relationship comes to an end. Focus on reaching a fair agreement how to distribute property, whether it’s a house settlement process or land settlement process. The more items agreed upon and settled, the less there is to sort out if anything has to be decided by the court. Come up with a basic draft of an agreement that includes as many of the above details agreed upon ahead of time. This shortens the property settlement process and focuses any final vetting by an attorney and saves billing from time spent asking you for the details you already know. 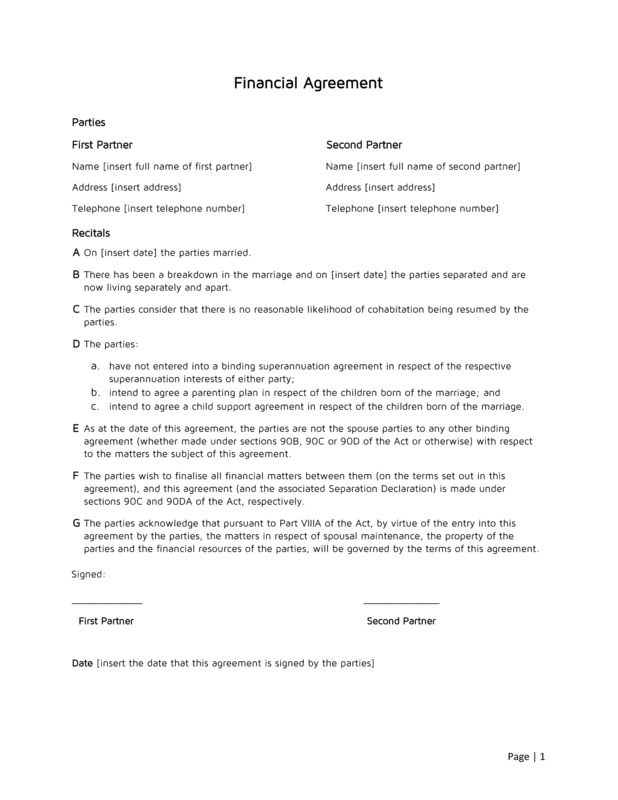 This agreement draft indicates straightforward information including contact numbers, address, date of marriage, details of separation, conditions, and other relevant details of you and your ex-partner. Once a couple reaches an agreement or gets close, the parties have four options for making it official: a court-imposed settlement, a consent order, or a binding financial agreement. The first two equal a gamble, as discussed earlier. The third remains the one folks can control the most, which in turn influences their outcome the most. So, it makes sense to try to make the agreement option happen as much as possible to make sure assets are divided fairly. If you need help filling out a divorce property division form, contact our Sydney Law Firm. Once you have received a good, third-party read by a licensed attorney, and both partners are satisfied with the mutual property settlement agreement produced, it can be brought to the court of Australia and made legally binding. The agreement will be recognised and turned into a legal document, settling all property titles and debt per the terms of the agreement. And you will be able to move on with life with the most control possible of the separation outcome. If all else fails, you can always seek legal advice from a qualified solicitor in Sydney. They should advise you on the best step to take should you have any issues with dispute resolution, spousal maintenance, property and debts, child custody, divorce and property and other matters concerning divorce laws.